Anyone who’s anyone is talking right now about the series finale of Lost. But lost in the mix, another ground-breaking show is finishing up its run on Monday night. Nine years ago Jack Bauer started the longest day of his life and he’s been going strong (if not a little ridiculous) ever since. While 24, like any show with this long a run, has had its ups and downs, there’s no denying this final season has been one of its best. As 24 heads off the air let’s take a look at some of the highlights and lowlights of the real-time classic. One of the classic whhaaaaa? moments took place when Jack walked into the room to find Nina had iced Teri to finish of season one of 24. It capped off one the most ground breaking seasons in television history and left viewers wondering about what they’d just seen. We’d spent 24 hours following Jack around as he worked to save his wife, only to see her get offed in the final moments. It was a monumental risk that mirrored the badassery of the show in general. Television had been flipped on its collective head. Before Barack Obama made history, if you were to ask a 24 fan who they’d picture as the first black President of the United States, the answer would easily be David Palmer. Dennis Haysbert’s role as first the candidate, then the President (and eventually assassination victim) was played with the strength and poise we’d like to see out of all national leaders. Too bad most of them don’t have an ounce of Palmer’s toughness or tact. What can I say, I miss the guy. Next to Kiefer Sutherland, no actor has done a more admirable job on 24 than Gregory Itzin as President and general piece of slime, Charles Logan. Logan was such a classic villain because, as President, he was in place to do the most damage. His constant maneuvering and anti-Bauer motives made for some classic television. He made deals with the Chinese, worked against America and made a triumphant return this season just as creepy as ever. Chase was one of those guys I wish had hung around the 24 universe a little longer. Dating Kim aside, Chase had a great demeanor and was willing to do whatever it took to save lives. That even involved getting his hand chopped off. Yikes. Near the end of season three, with a potential virus about to be released, Chase took one for the team and strapped the last vial to his wrist. Jack promptly cut the hand off with a fireman’s axe. 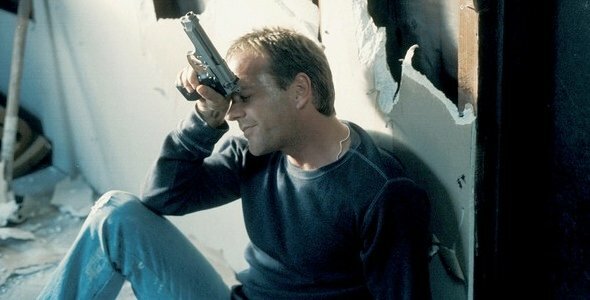 When you are trying to impress Jack Bauer sometimes you need to lose an appendage or two. I’ve always wondered what the hell that girl spread over her hand before she shook Palmer’s at the rally that caused him to suffer some kind of heart attack. Does anyone else know? When Palmer went down, it was the best kind of cliffhanger. Hell, we loved the guy. He was the President (better than Bush at the time) and thinking he might have fallen victim to an assassin was brutal. He ended up with a weird, scarred hand, but he was vulnerable. No one is safe on 24. By all accounts, Chappelle was a creep, but that didn’t mean he deserved to die. What’s worse is that terrorist Stephen Saunders forced everyone’s hand by ordering the execution. Jack tried to let Chappelle do it on his own, but the guy just couldn’t pull the trigger. But Jack could. That’s why Jack is kept around. He’s got no problem gunning someone down to help America. 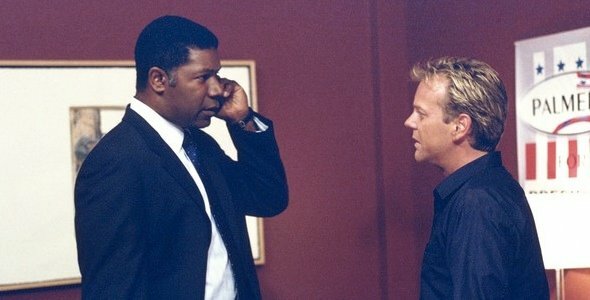 The only person who can kill Jack Bauer is Jack Bauer. Don’t you forget it. So the Logan administration let a sigh of relief when Jack, after learning Logan was gunning for him, pretended to take his own life. I wouldn’t want the task of killing Jack so if he’s willing to do it on his own, even better. Unfortunately for Logan and company, Jack just went to work as a day laborer. He would soon be back fighting evil. Setting a show in real time was something we’d never seen before. Making it tense, well-timed, dramatic and action-packed was something else altogether. 24 shook up television by placing its characters in impossible situations and taking us minute by minute through their issues, problems, decisions and consequences. And it will always be remembered for the classic “Beep, beep, beep, beep” that left us waiting on the edge of our seat. It’s not that I mind giving the guy a little vice or weakness. When you work deep cover like Jack, these things happen. It’s that his addiction came and went away just as quickly. Any 24 viewer must be able to suspend a certain amount of disbelief, but Jack’s drug addiction was just too convenient a plot device that went away as quickly as it came. At this point, why would anyone ever go to work at CTU? Half the people who work there are either inept or working for the bad guys. It’s been blown up, attacked with gas, infiltrated by terrorists, hacked in to, had its fair share of shootouts and moved locations more than a few times. Who would even apply there anymore? That’s how they end up with ex-cons/ terrorists like Dana Walsh this season. The talent pool has just run dry. The misadventures of Kim Bauer Taken hostage by terrorists. Framed for murder. Babysitter for a child with an abusive father. Chased by a cougar. Gets a job at CTU because of nepotism. Marries a douchebag psychologist. Dyes her hair white. Gets taken hostage again. These are just the ones I can remember. Kim was just the worst. For the second half of its run, 24 became a victim of its own format. Rather than driving the plot through character development, the writers instead chose to just escalate the problems. In many of the latter seasons, Jack was forced to solve bigger and more unrealistic problems as the days went on. And because of this many elements were repeated. We knew there’d be a mole in CTU, the little bomb at the beginning would lead way to a nuclear bomb at the end, the government was corrupt and Jack would be forced to go above and beyond because no one else would step up to the plate. It was less about Jack and more about wanting us to be surprised (which we weren’t). This season (by all accounts great) went back to its roots and chose to look at Jack as a suffering human rather than a superhero, problem solver. As a show, 24 did something totally new, and did it great (at least for awhile). It’s easy to forget that now, so many years, and terrorist attacks, later. As Jack walks off into the sunset, he goes knowing his story changed television. It’s a testament to how creative and consuming a show can be when (like Jack) people take risks. 24's series finale airs Monday, May 24 (8:00-10:00 PM ET/PT) on Fox. CLICK HERE for a preview of the final two hours of the series.